Posted by cath in comfort food, general info, Recipes, specials. Taste and season with pepper, adding sweetness with a pinch of sugar if necessary. Your gravy will probably be thinner than the instant stuff, but as long as you keep tasting it and have a good flavour, don’t worry about the thickness too much. Keep practicing – you’ll soon become the gravy expert. But what if you want some gravy for sausage and mash, or haggis, neeps and tatties – you have no roasting tray and no meat juices…the answer is that you have to start with a base (i.e. onions), and some freezer store items come in very handy. Fry the onion on a low-medium heat in a small frying pan with very little oil (1 tablespoon is plenty for a big onion) until soft and browned (at least 10-15 minutes to make sure it is well cooked). A few minutes before you need the gravy, turn the heat up in the pan and add the alcohol (or water) to de-glaze the pan, and reduce to a thick glaze. Add the stock and a bit of water and again reduce well on a high heat. Stir in the tomato puree and allow to bubble. Sprinkle in some freshly ground pepper and 1 tsp dried herbs. De-glaze any other frying pans with a splash of water and add this to the gravy (e.g. if you’ve been cooking sausages in a dry frying pan, it’s a good idea to get the caramelised juices from this pan into the gravy). Taste the gravy. Don’t be tempted to add salt! But test it for flavour and consistency. As the gravy reduces on the heat, you may need to add more water – use the potato (or vegetable) cooking liquor at this stage if you can – add a few splashes at a time, checking the consistency until it is runny but not watery. Adding sugar, balsamic vinegar, pepper, more herbs, lemon juice or a very tiny splash of soy sauce can help with flavour if needed – but the more caramelised juices you can add, the less likely this will be necessary. 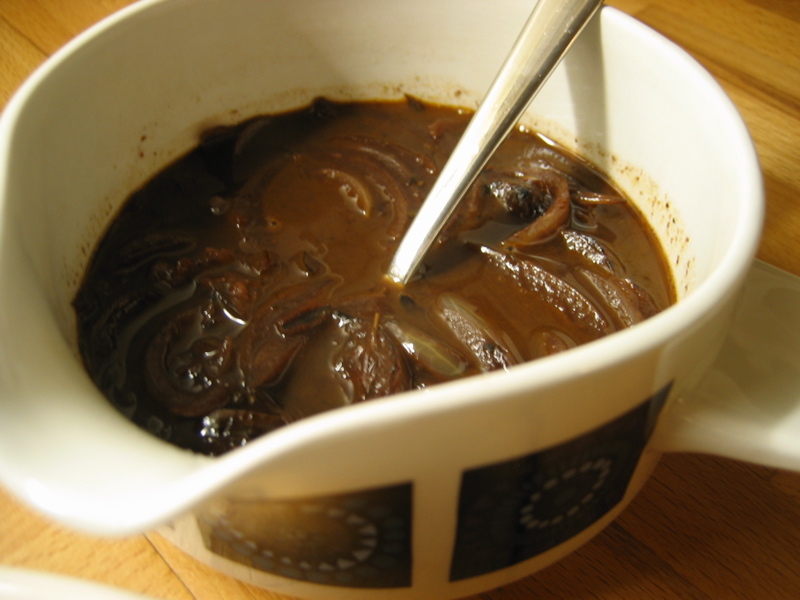 Pour the finished onion gravy into a jug and serve. 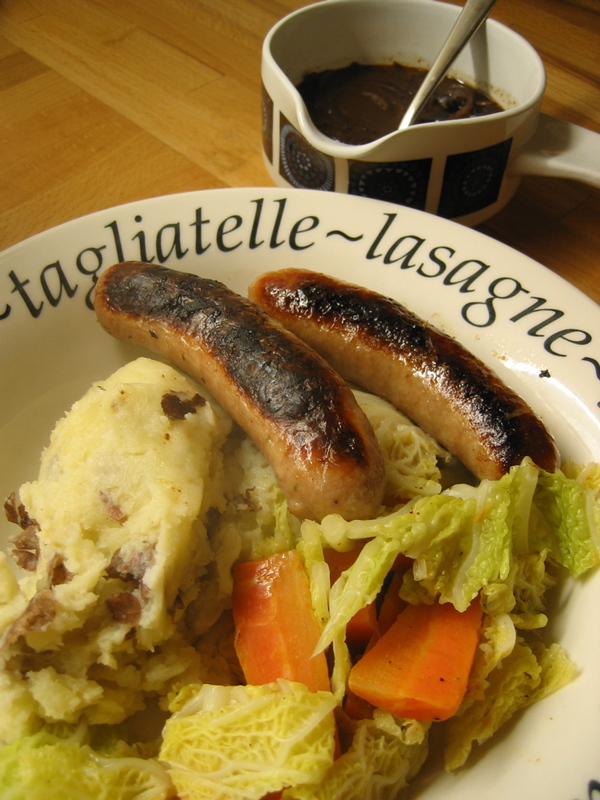 Sausage, mash, cabbage, carrots and onion gravy! Have you tried cooking sausages in the oven? You can sometimes buy huge Cumberland sausage rings which work best cooked in the oven – and better on a trivet of unpeeled, halved onions. You can also try this with normal sausages – the larger the better. Adding onions and their skins to the roasting pan gives you another flavour for enriching the gravy and enhancing the colour. Once everything is cooked, remove the sausage and onions from the roasting pan, de-glaze (as above) and then squish and work in some of the roasted onion as you make up the gravy. Roasted garlic similarly imparts a great flavour into gravy. For roasting joints of meat, onions, garlic and carrot make a good trivet and a fantastic tasting gravy. Posted by cath in Recipes. In winter, when the local tomatoes have all gone, your roasted tomato sauce and tomato/onion and garlic sauce will come in very handy. 1. Just defrost the tomato, onion and garlic sauce overnight. Then add any other ingredients you’d like (i.e. fried mushrooms, or sliced chorizo), heat through and serve with pasta topped with a little cheese and parsley. 2. 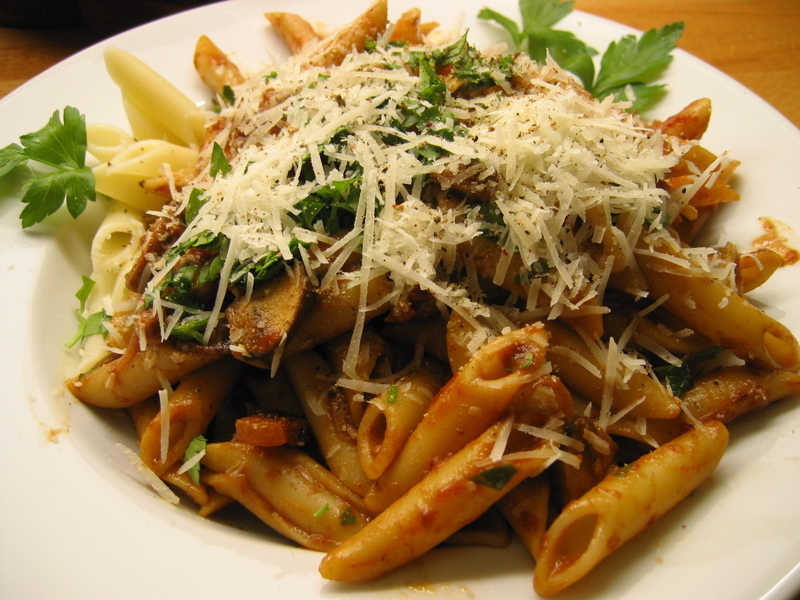 Try mixing a little of the sauce above with a spoon or two of concentrated roasted tomato sauce for an extra special tomato sauce combination. 3. For the roasted sauce, add a cube or two of homemade chicken stock, a small cup of water and heat for a rich tomato sauce. 4. A big sauce made from roasted tomato puree can begin by frying up some onions and garlic, then adding the sauce and stock or water, followed by the other ingredients. A jar of Passatta (sieved tomatoes) can come in handy when you’re running out of your frozen sauce, or can be added to make your sauce go further. Of course, you can always use tinned tomatoes instead. Posted by cath in Info and Cooks Notes, ingredients, Recipes, shopping notes, stir-fry. You can try using white wine, or if you happen to have some dry sherry, that would be better…but really there is nothing better than the real thing – it keeps well once opened. Really useful for more than just Chinese food…You only need to soak them for around 10 minutes in warm water, then chop and add to the dish. Some cooks suggest removing the more fibrous stalk – but it’s never done me any harm! I also add chopped, soaked mushrooms them to risotto – and soaking a mixture of dried porcini, chanterelles and shitake for half an hour or so makes a fantastic mushroom stock for the risotto too. 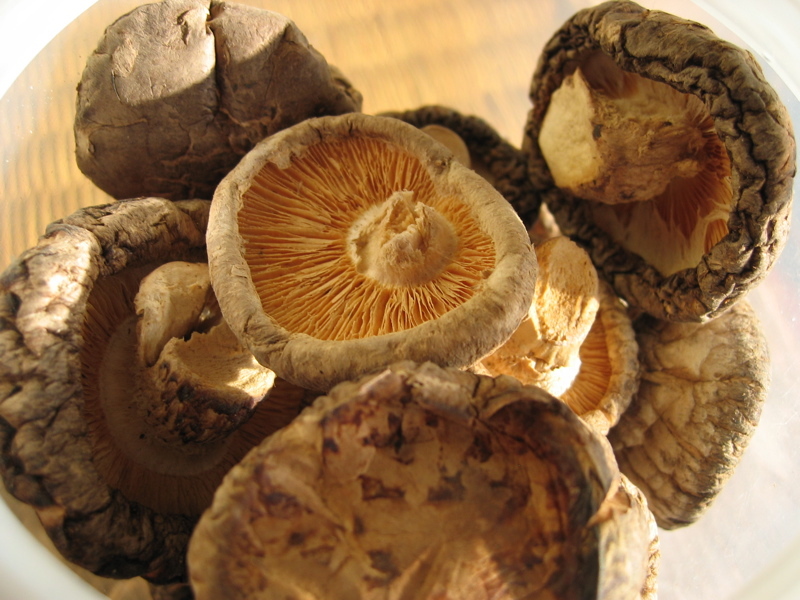 I would also consider them as a substitute for fresh mushrooms in other recipes too. 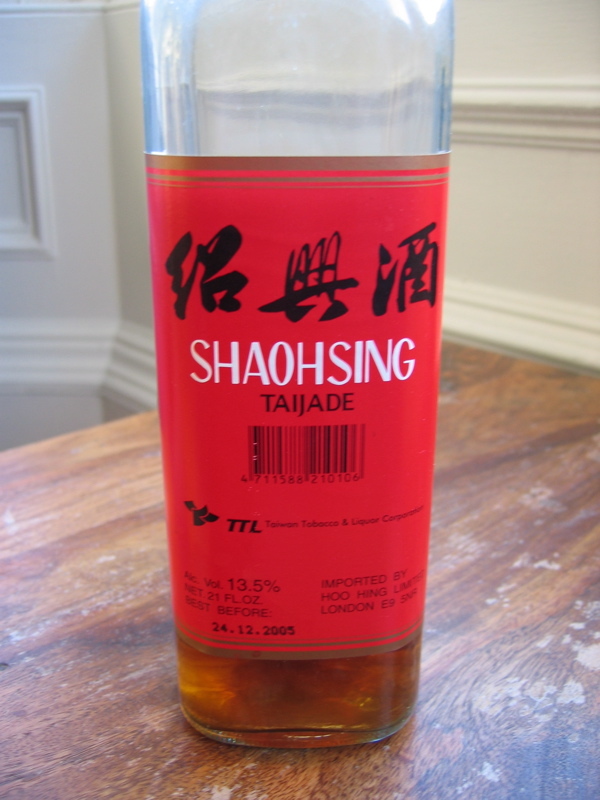 Also good for marinades and to add some nutty flavour to noodles. 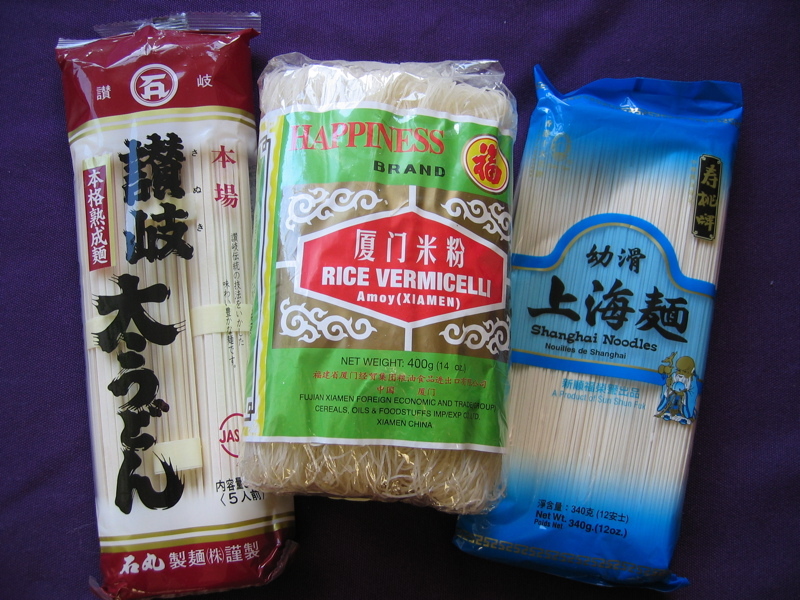 You can get a vast array of Chinese (and Japanese) style noodles, quick to cook so that always means fast food! 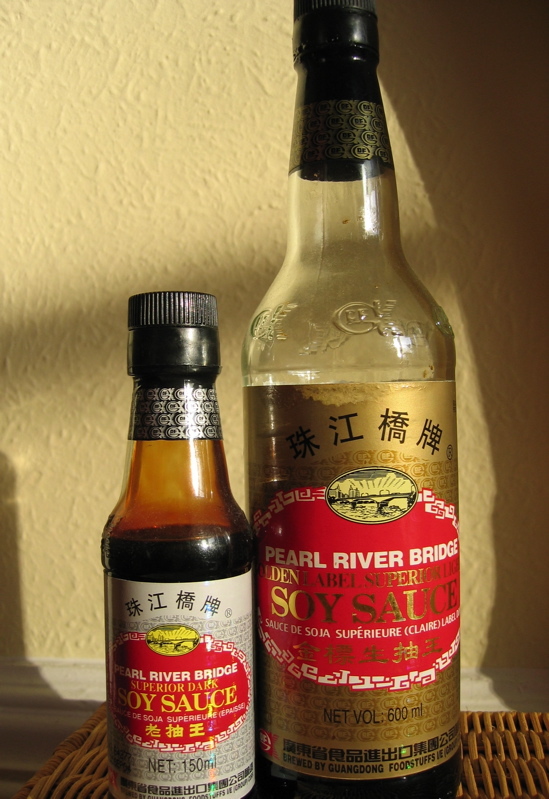 Excellent for a variety of marinades and sauces (including Sweet and Sour Sauce). Keeps (for ages, and I mean literally years) in a cold cupboard or in the fridge. Vegetarians, look out for a mushroom version, which is very similar in style to this sauce and makes a good veggie substitute. A must have – and definitely worth buying these large bottles at the Chinese supermarket they are much cheaper than supermarket equivalents. The Light version is usually added to cooking and to season the finished dishes. 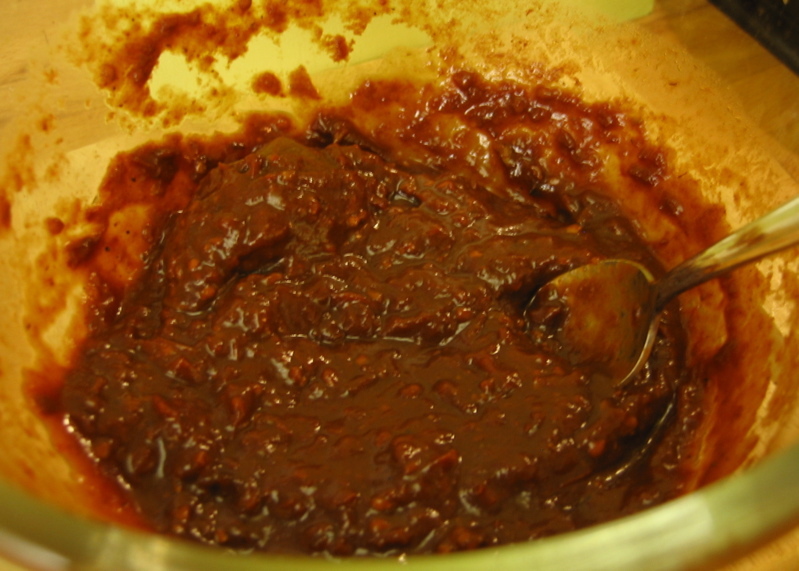 The Dark version more often used in marinades.